Lauren Sanderson '18 accepts the 1819 Award from President Brian W. Casey. Photo by Mark DiOrio. 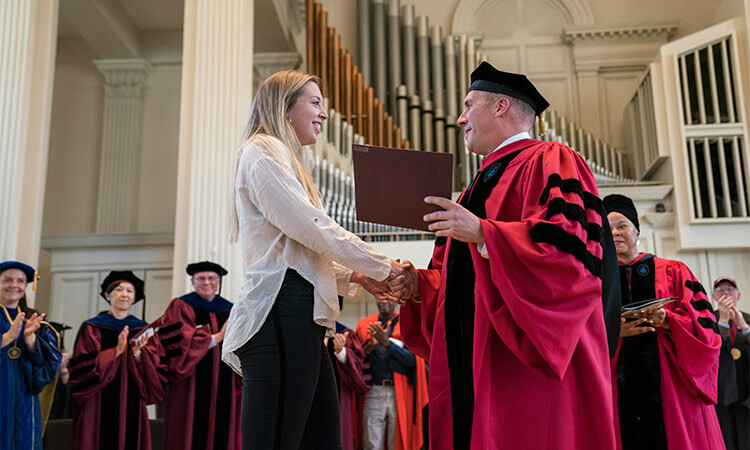 Lauren Sanderson ’18 is an entrepreneur, student-athlete, academic all-star, and a soon-to-be published poet who now adds Colgate University’s most prestigious student recognition, the 1819 Award, to her impressive résumé of accomplishments. The 1819 Award is given annually to one graduating student whose character, scholarship, sportsmanship, and service to others best exemplify the university’s spirit and the value of a liberal arts education. Hailing from London, Ontario, Sanderson is an English major with an emphasis on creative writing. She was the 2017 winner of the Lasher Prize for outstanding talent and has received the Dean’s Award every semester of her Colgate career. On the volleyball court, she was ranked first in setting by the Patriot League and 13th nationally for assists. While attending department-sponsored workshops, Sanderson organized her own writing roundtables, encouraging and teaching friends and classmates to express themselves through writing. She is a member of the board of organizers for Lounge, an organization that hosts open-mic nights off campus. A peer tutor on campus, Sanderson also volunteers her time in Sherburne, N.Y. to mentor middle school students. Outside of the classroom and off the court, Sanderson is an active member of the Thought Into Action Entrepreneurship Incubator, where she and Brandon Doby ’18 earned $1,000 in funding during Entrepreneur Weekend for their film-production company, ISO, and was named one of this year’s $13,000 Entrepreneur Fund recipients. Sanderson’s poetry manuscript is slated to be published by Write Bloody Press in March 2019, and she will be embarking on a 20-stop promotional tour after graduation. She plans to apply to graduate school to earn an MFA in creative writing.